a large, 49"dbh Douglas Fir that had uplifted the porch and its foundation of one of our client's properties in Gladstone, Oregon. 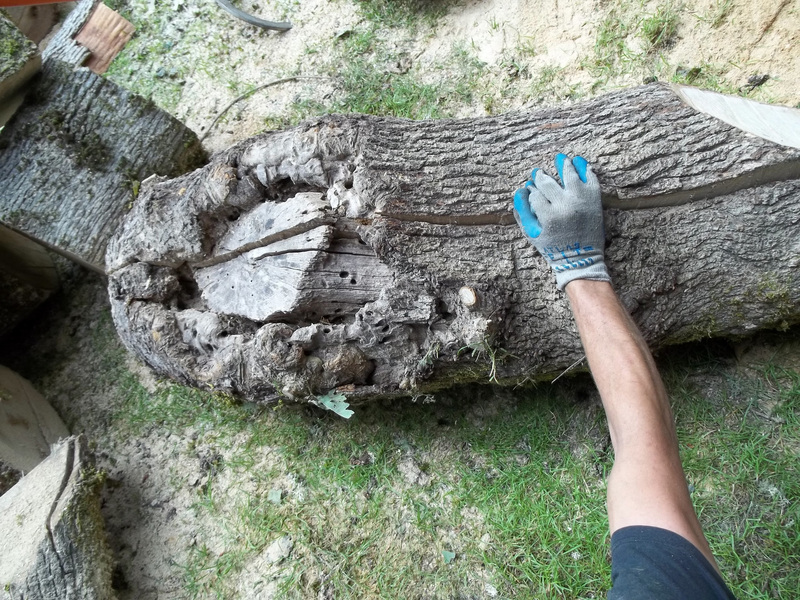 This exquisite log was so marked by excessive bark growth, that it had to be shaved to grant clean access to the felling cut. The upper stem was dismantled using conventional rope techniques, and the lower stem was precisely felled with the aid of mechanical advantage: wedges and a rope-and-winch controlled rigging system. 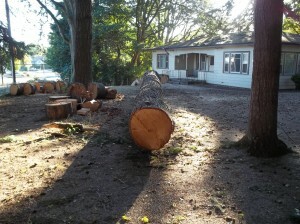 We recently removed a large Douglas fir from the Luvaas residence in Tualatin. On account of the large logs (41″ d.b.h), we chose to use a 40 ton crane. This was the safest and most cost effective solution as the fir was within 10 feet of the home and could not be lowered using conventional means without damage. 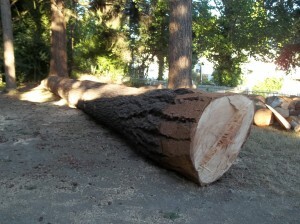 No damage was done and the wood was taken by Mike Bruno of Sub-Urban Forestry to be salvaged as urban timber. Rick of Smith Crane was our operator and he did a very capable job with the jib at 70′ from turret to stump and a limit of 4,000 lbs. Dan Oliver, one of our arborists and lead climber is here setting the picks and cutting. 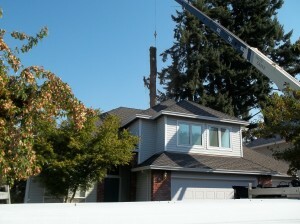 The large fir sits behind the house: climber is setting the rigging for the pick. 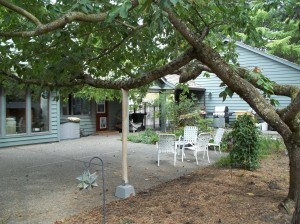 Pete and Eileen Carey of Tigard, Oregon love the Japanese Flowering Cherry tree in their backyard patio. The shade and flower display is superb. We have pruned the branch several times to reduce the weight in it. To prevent this long and heavy branch from failing we have here installed a brace system to support the limb. The brace was milled from a slab of quarter sawn Oregon White oak that had been salvaged from a necessary removal. 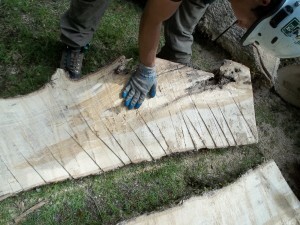 It has been set here at a precise height to insure that the branch continues to develop good holding wood at the collar. 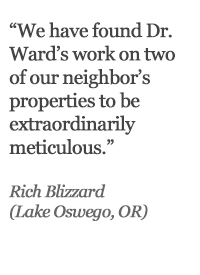 What a pleasure to pay it forward! 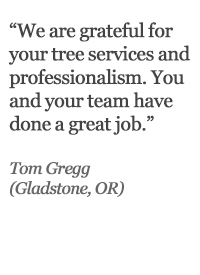 Ward Tree Care, LLC is a locally owned and operated full service tree care company in Tualatin, Oregon. Our shop is located near I-205 and Stafford Rd. 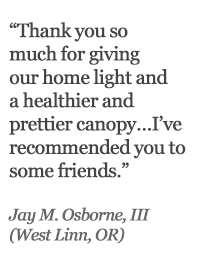 We proudly serve West Linn, Lake Oswego, Tualatin, and the Portland Metro area including Wilsonville, Tigard, Beaverton, Cornelius, Durham, Gladstone, Happy Valley, Hillsboro, King City, Milwaukie, Oregon City, Sherwood, Newberg and Canby. 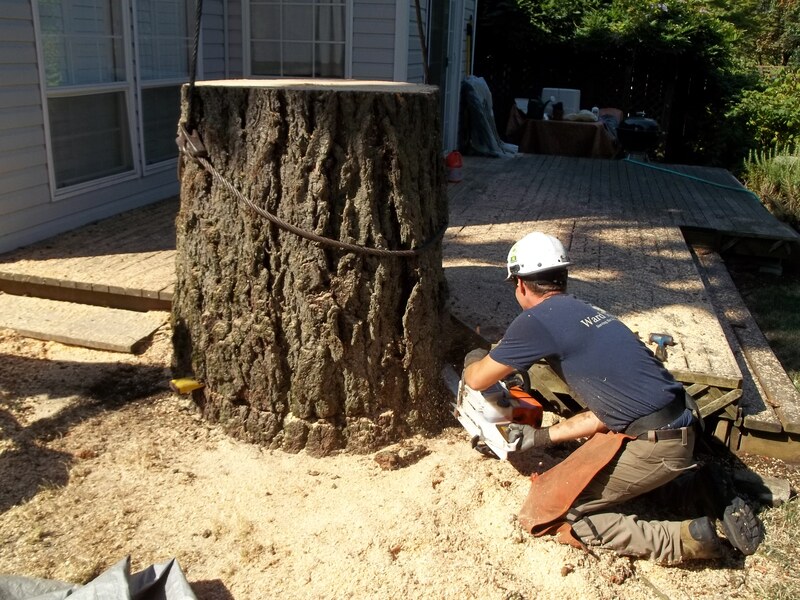 We offer the highest quality tree work and superior customer service. 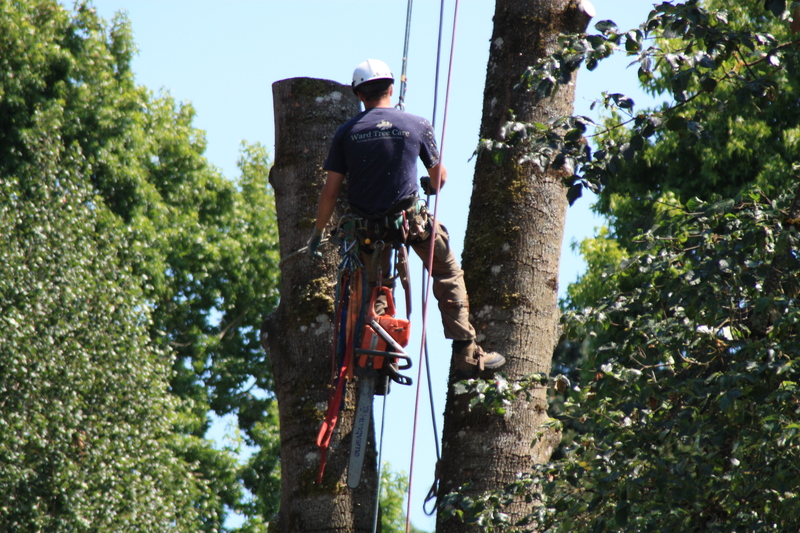 Ward Tree Care is a local leader in arboriculture and strives to provide personalized service, expert knowledge, and exceptional workmanship. Please explore our website to learn more about our services. 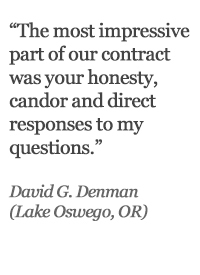 We are licensed, bonded, and insured (CCB# 188437) for your protection and the safety of our workers. 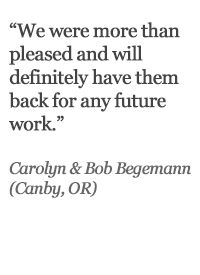 We were recently contracted by a family in Newberg to evaluate their trees and perform the indicated work. 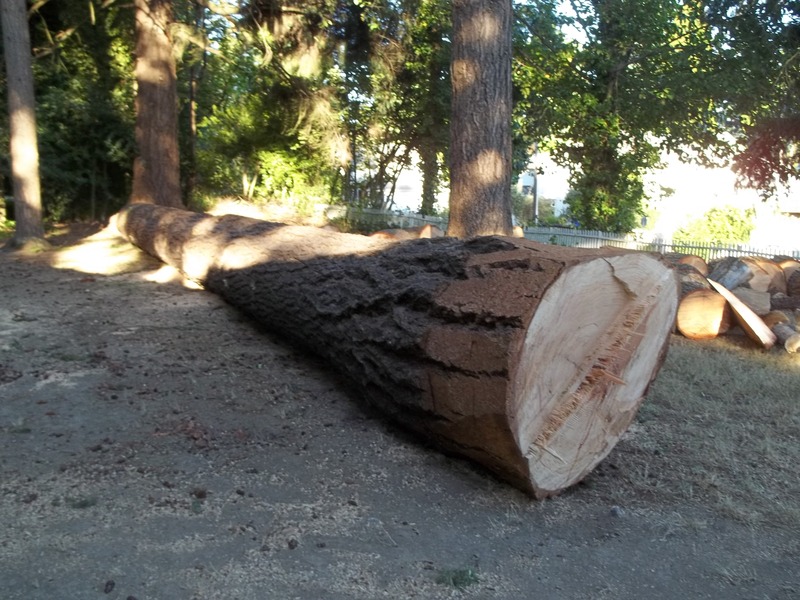 I noticed that a large Oregon White Oak which leaned over their bedroom had a large flush cut wound on the central stem that was not closing. Upon inquiry I learned that the tree had been pruned about six years ago. Given the size of the oak, its proximity to their bedroom, and the advancing decay in the stem a recommendation for removal was given. Here are photos to confirm our judgment. 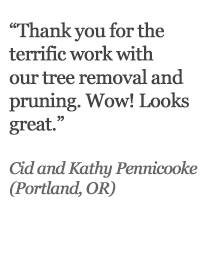 It is also confirmation that improper pruning can cause serious damage to a tree, which can in turn present us with potential hazards.